On the one hand radiotherapy always enriches itself at the expense of new planning technologies and irradiation implementation. On the other – nowadays radiotherapy is impossible without the last cytostatic, targeted, immune, gene therapy. That`s why the holding of this interscience congress is very necessary. Many of us take part in new technic and technologies development, gaining invaluable clinical experience. It`s very important to share it with each other. Our main aim – to unite professionals of related areas on the one stage for sharing experiences and advanced knowledges. Member of the Russian Academy of Sciences, Doctor of Medicine, professor, President of Russian Association of therapeutic radiation oncologists. Captains of the world medical business together with NMRRC will develop technologies and techniques against cancer. Scientific and production capacities of organizations will focus on the development of technologies against cancer. 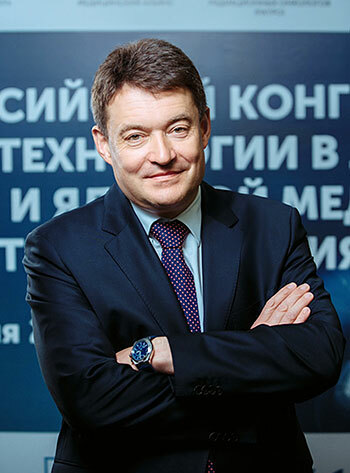 According to the order of Ministry, academician, director general of FSBI «NMRRC» of the Russian Ministry of Health Andrey Kaprin was appointed as a chief off-staff oncologist of department.